When they are kind enough to texture the model good looking wood is fast and easy. When they don't it becomes very difficult. I'll always be impressed with people who do it on bows and make it look right. Yeah this is true, now that i think about it the orc lobber was sculpted wood and only needed drybrusing or moving the wet brush sideways along the model to get it painted, but with the new plastics its all flat and you have to do the woodgrain yourself with better or worse success (easy on bows and similar but on big sufaces i have trouble myself). These ballistas are softly textured anyway, not flat. Really amazing work! What are you using the ballistas as? Did the VC get warmachines while I wasn't looking? I'd honestly forgotten that the undead lost their warmachines. 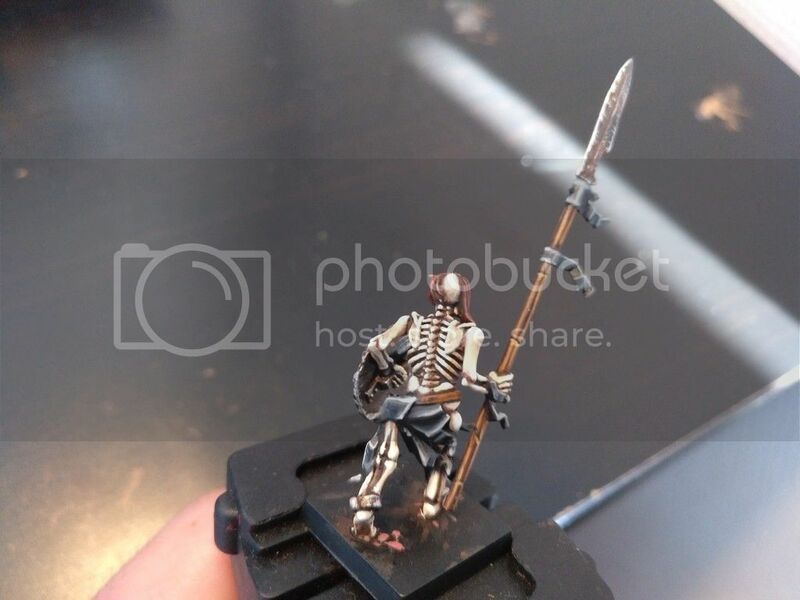 I've always wanted a couple of the real old GW one, but not enough to decided to build an undead army. 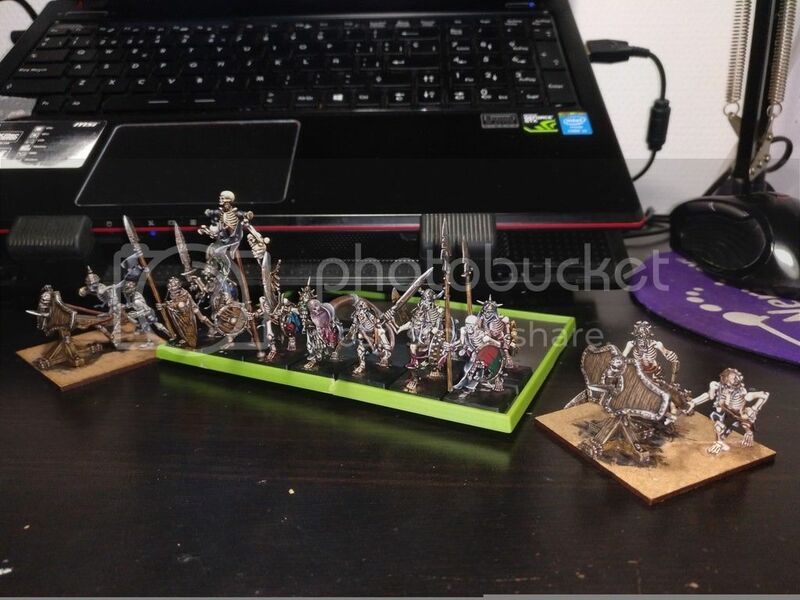 Yes i think they over simplified some armies too much with the pass of the years, like bretonnia and undead. 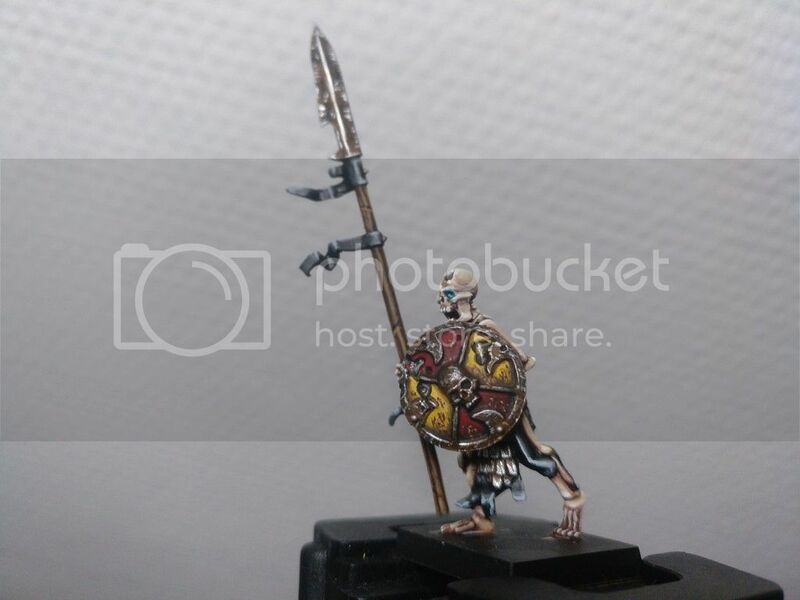 The 2nd ballista is done now, next 4 more skeleton warriors to finish up the 2nd row. I cant get good images in this tenebrous place omg! i really hate it. 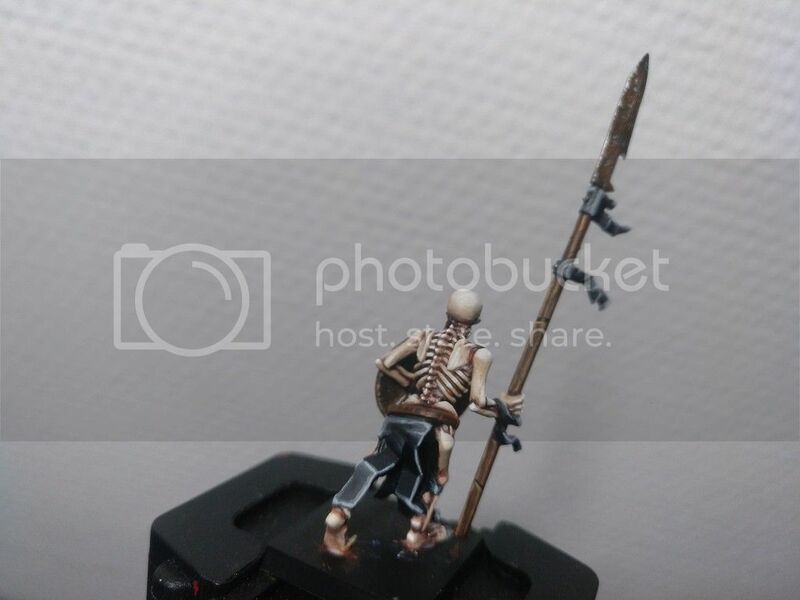 Comparison of 1st and 2nd ballistas bone colours. This new grey is charadon granite base+bone+white. No wash.
And finally a group shot with my progress! Absolutely love how those units look together. Not necessarily uniformitarian, but one gets the feeling like they belong to a single warband (not just because of obvious reasons). Kind of like an early medieval warband serving under one lord before the concept of standard issue armor/clothing was implemented. 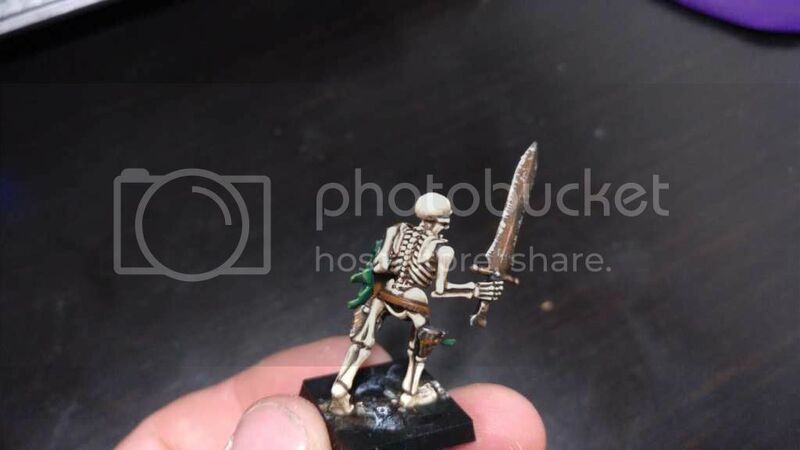 The second balista, of course looks just as amazing as the 1st one, but I have to say that I'm more impressed by them bones of the first crew. They look warmer and more lively if one may say so about a pile of reanimated bones. Looking good. 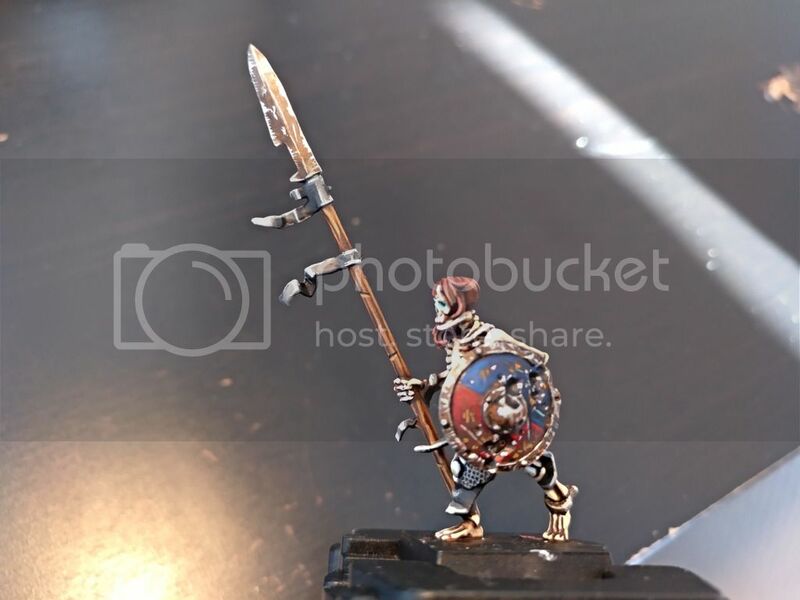 Any thoughts on basing yet? 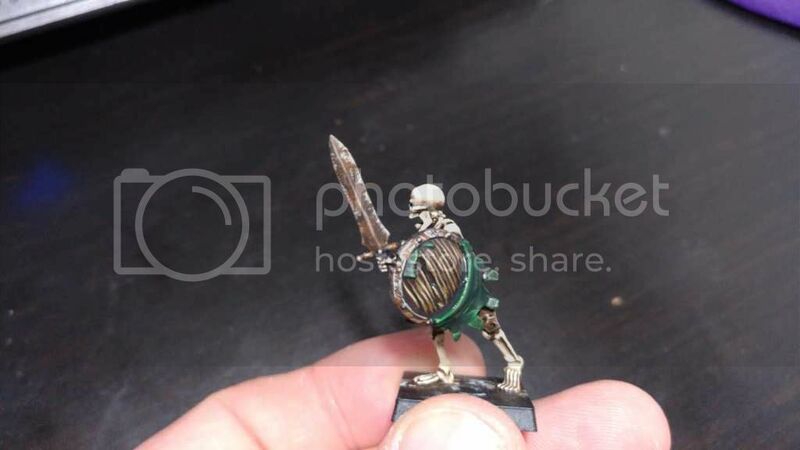 Thanks, this is the concept i pursue with the army, only the wight guard should be uniformed. 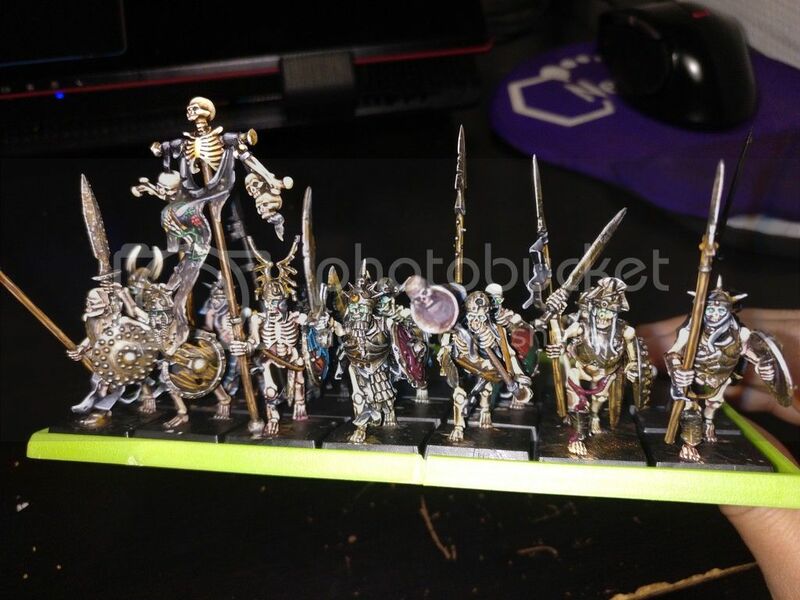 Still as i look as the 10 warriors i painted now i think i went a little bit too colour happy considering the bones also show shade variations. Im gonna restraint myself a little bit on the pallete for the shields patterns while trying to keep them different from each other. Lol. 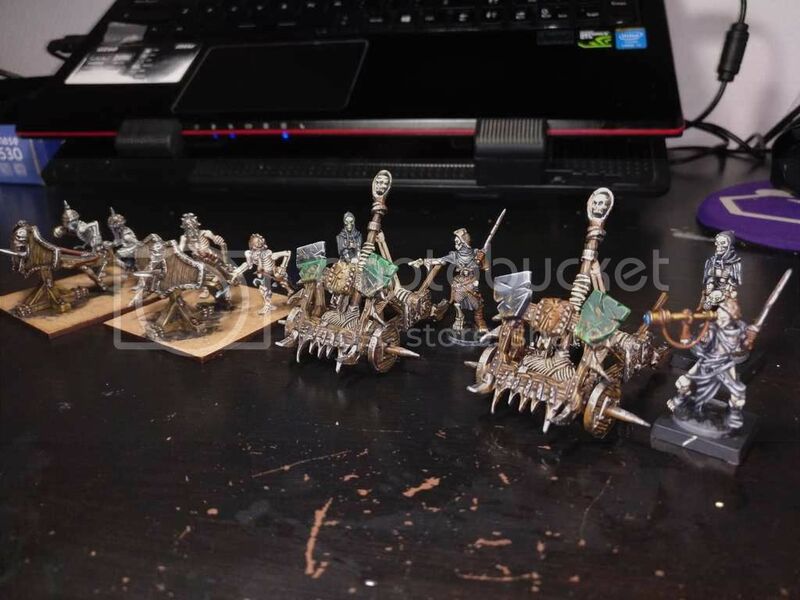 well this might be true, still im gonna be trying different bone patterns to add some variation on the army (and also making painting less monotonous); i did the same on the orcs and it worked out pretty well both for my motivation and for the regiments appearance. 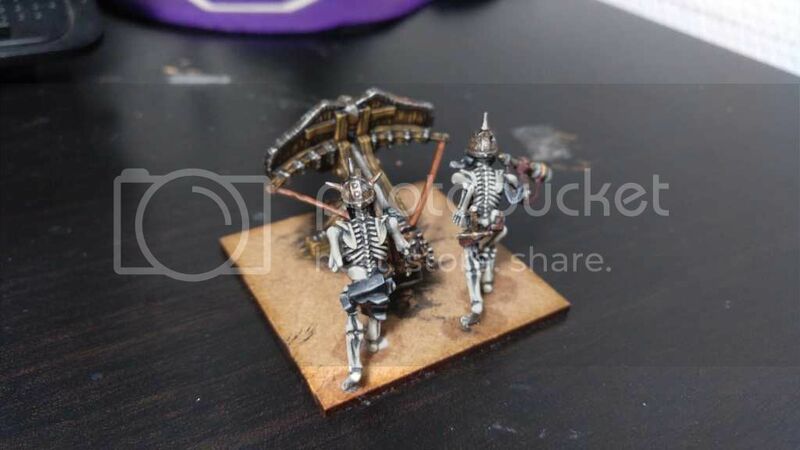 The skeleton warriors all will be based on brown and bone colour, however the wights and black knights i want to make them grey/white as if they hadnt been risen from the mud itself and instead they are resting on their catacombs and coffins with their bones clean. We will see how it turns out as i go further. I think im gonna go with wet mud and some patches of burnt grass here and there. 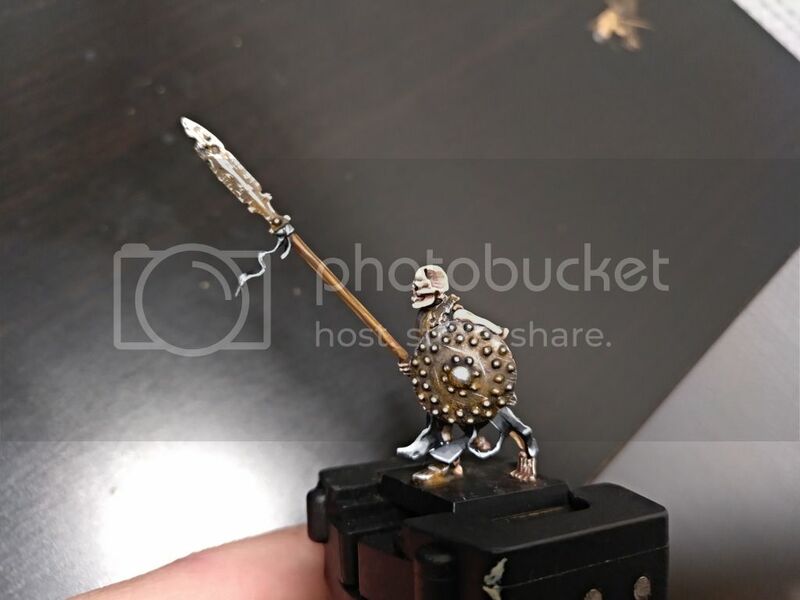 A friend also proposed adding rusty wargear on the bases and i will do it but not on every base, in a whole unit of 35 models like this one im painting maybe i add 10-15 rusty weapons and pieces of armour and other battle debris split among the members. This went to Khemri when they split the list didn’t it Shannar? The units are coming together nicely. The second ballista is great as well. 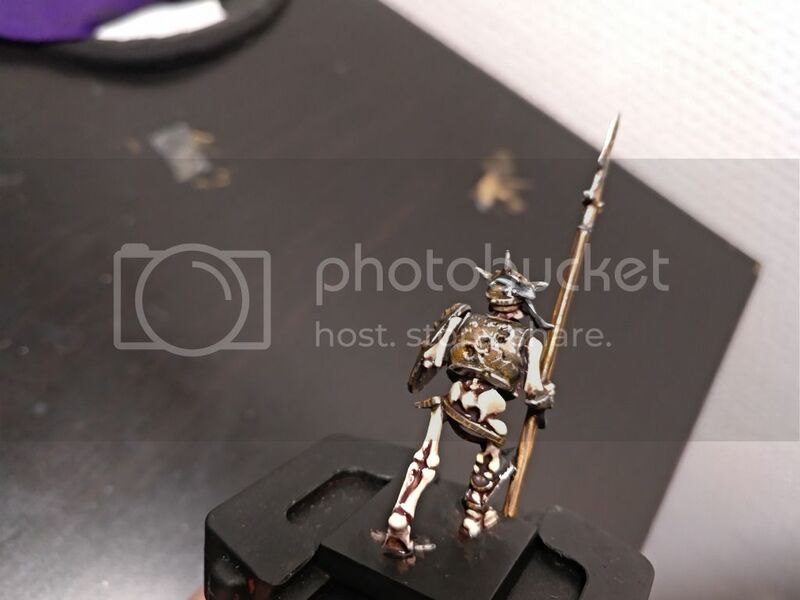 A friend also proposed adding rusty wargear on the bases and i will do it but not on every base, in a whole unit of 35 models like this one im painting maybe i add 10-15 rusty weapons and pieces of armour and other battle debris split among the members. I think this is important to keep it "realistic". It's not like all units in your army will be walking through a scrapyard filled with bits of weapons. 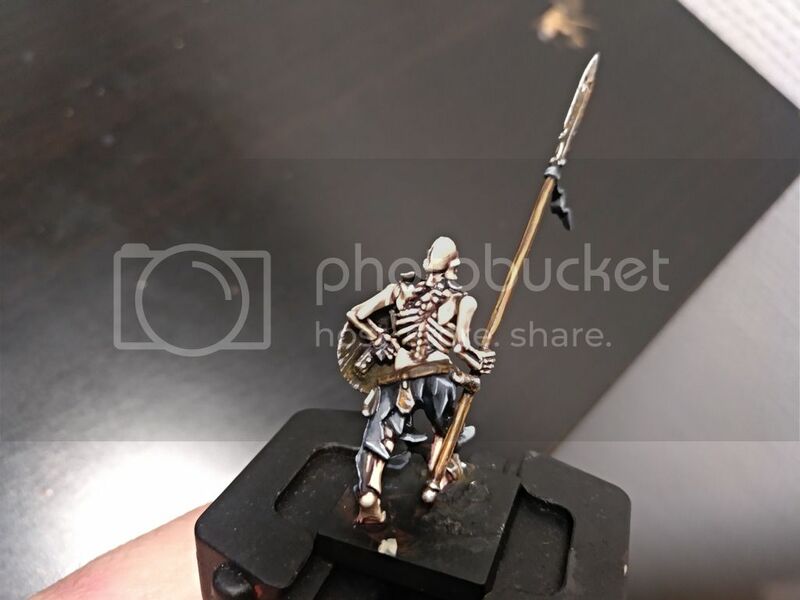 So having them appear only on some of them will keep the bases interesting without going overboard. 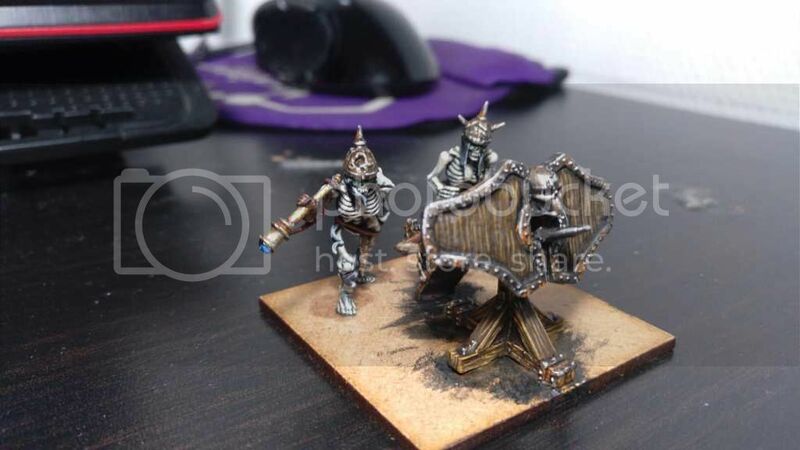 Apparently heheh, it is from the kings of war undead catapult. Last edited by Mireadur on Mon Feb 11, 2019 4:16 pm, edited 1 time in total. How did you end up in Antwerp? 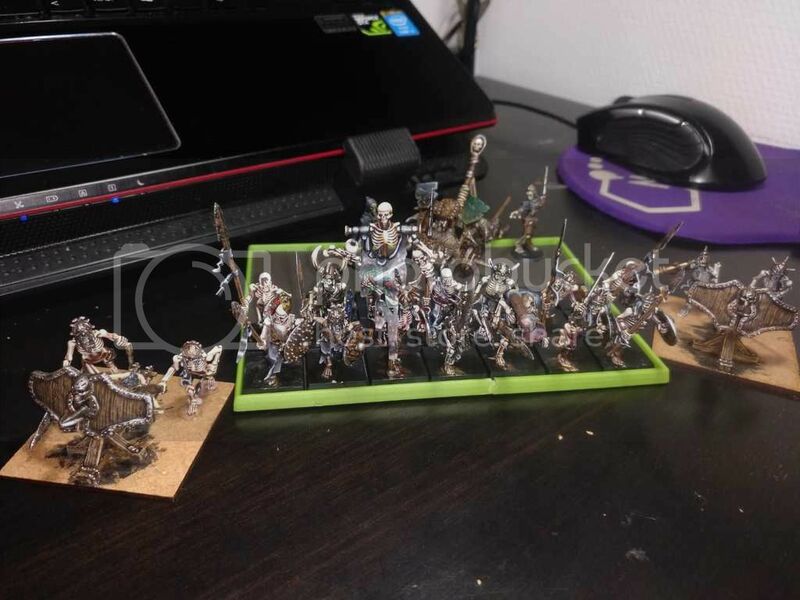 Still as i look as the 10 warriors i painted now i think i went a little bit too colour happy considering the bones also show shade variations. Im gonna restraint myself a little bit on the pallete for the shields patterns while trying to keep them different from each other. To be fair Antwerp is a nice looking city. No idea what it's like to live there. 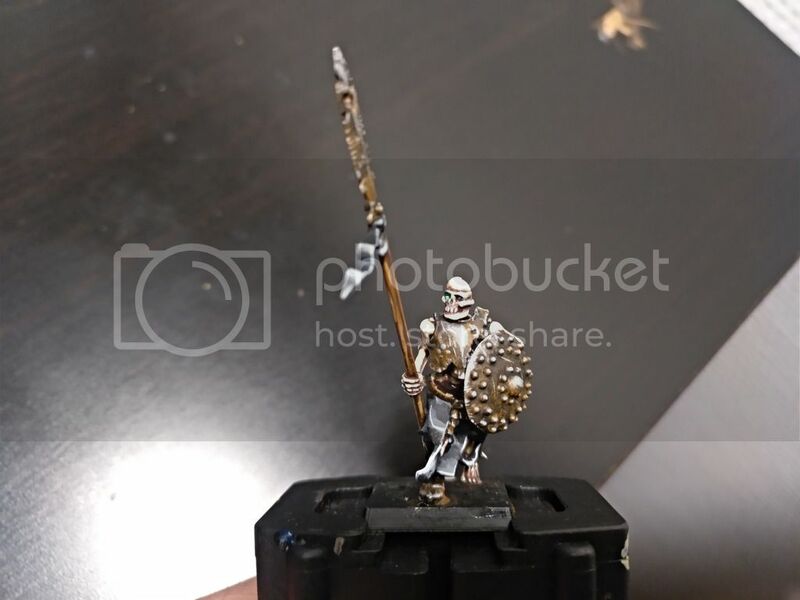 The first model is great! 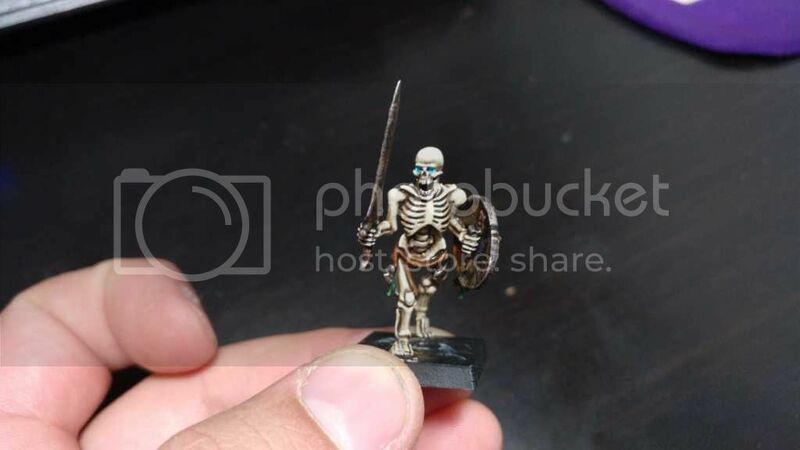 he looks very happy with himself and he radiates coolness (as far as that goes for a skeleton of course...). I think they’re getting even better. WoW its been rough this one, i blame the moment i thought of buying mantic models for my warmachines. They are trully awful man. 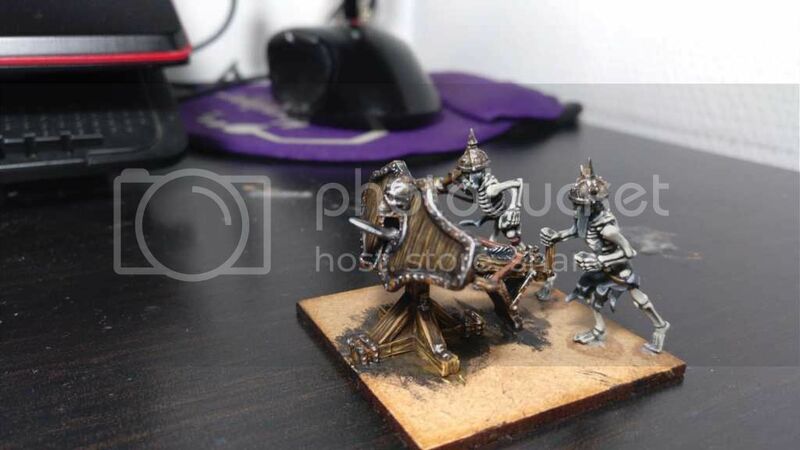 So discouraging to paint, i almost stop not only painting undead but painting altogether.. 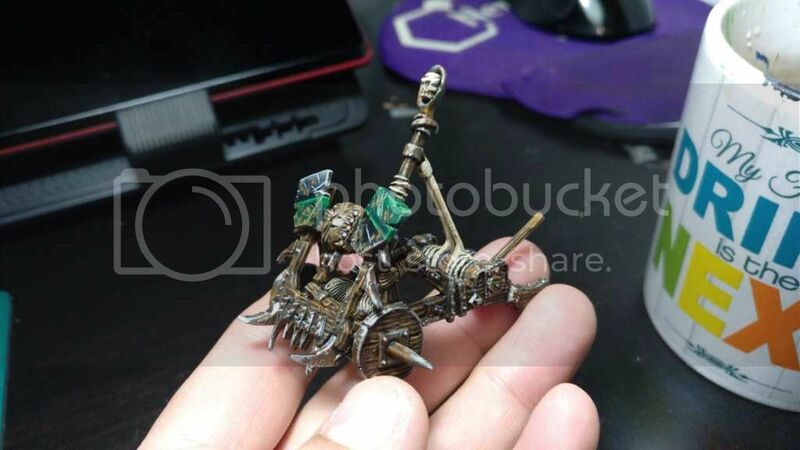 Anyway, i finished the 1st catapult and im going to keep punishing myself and attempt to paint the 2nd in a more reasonable time than it took me to finish this one. 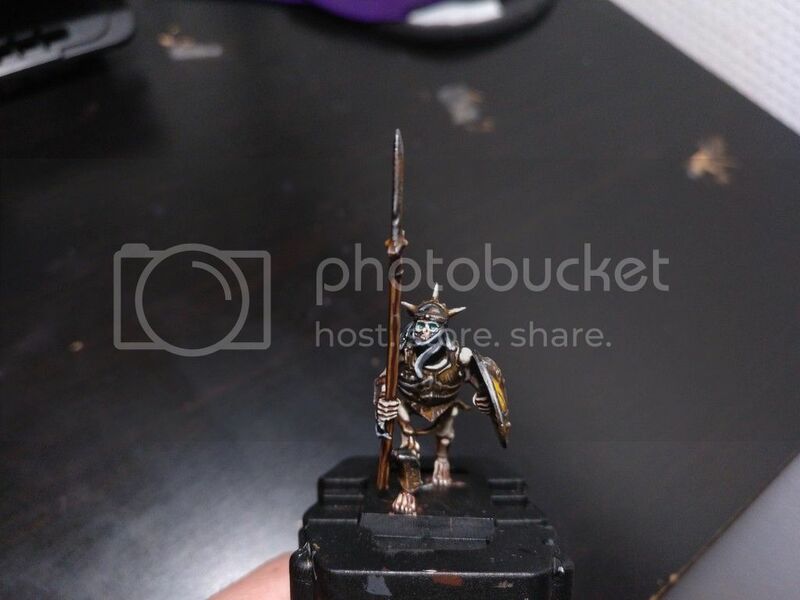 EDIT: small update on army progress. 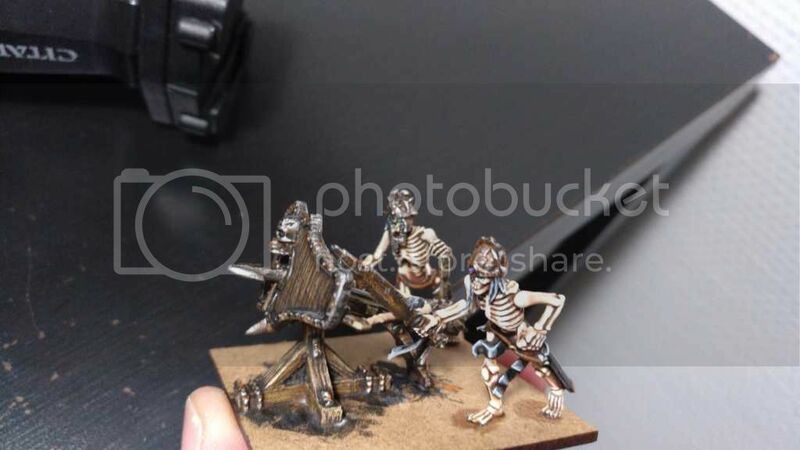 got to paint 1 more catapult, 5 skeleton warriors and then im out of undead models and will be painting again the plastic seaguard i have frozen since the last summer. The result isn't bad, but there are a couple bits that are funny looking. Does look like a lot of work went into this. Umm 3-4 hours the catapult i think. I finished the 2nd.. about this time definitely. 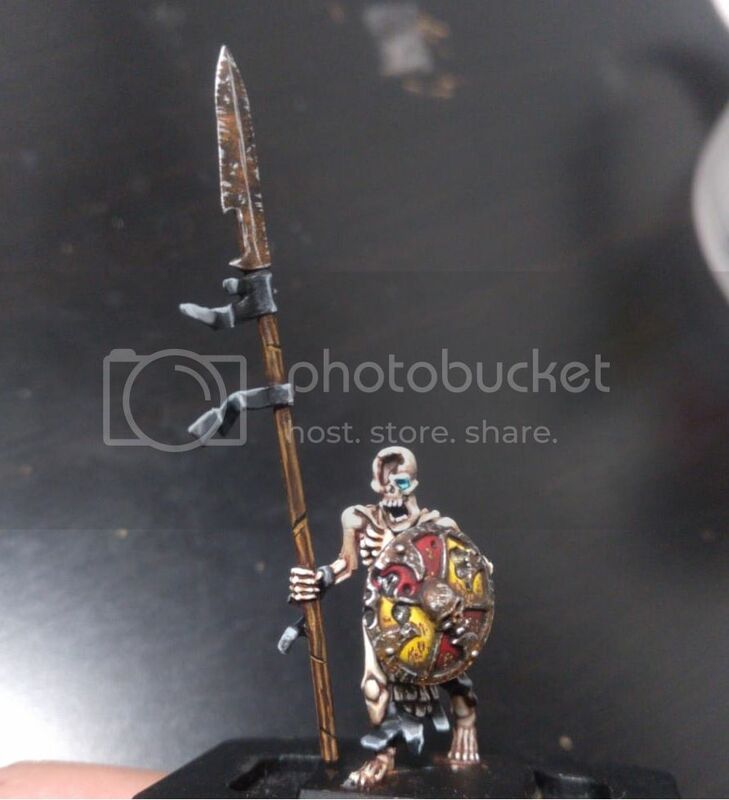 Its quick, but some parts are just confusing, for example i dont quite understand what is the leather? piece in between the shields and what is exactly happening with it. Is it broken? That leather bit is one I don't quite understand, and I also don't like the way the skull sits perfectly square. Warmachines done! 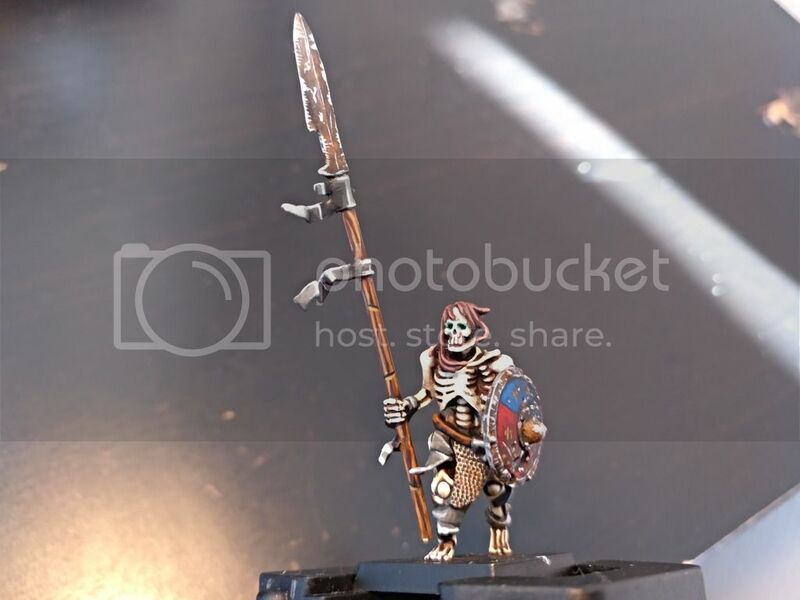 5 more skeleton warriors and i move back to the seaguard. I very much look forward to seeing the seaguard again. Umm 3-4 hours the catapult i think. Mine would have been half as good and taken twice as long! I very much like the final effect! 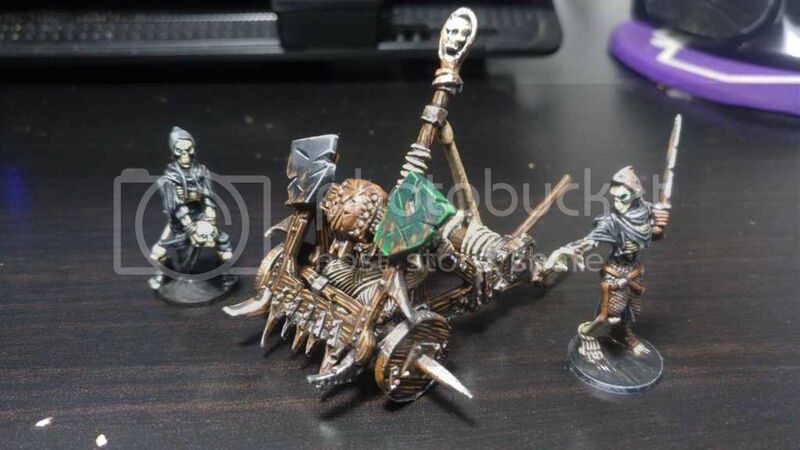 Especially the shields attached to catapults (and other dead boys) look marvelous. I like them. 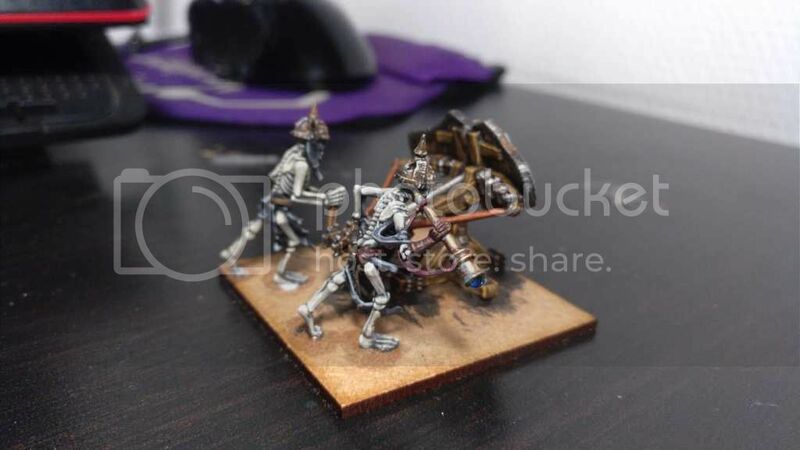 The catapult operators remind me of DEATH from the Discworld novels. 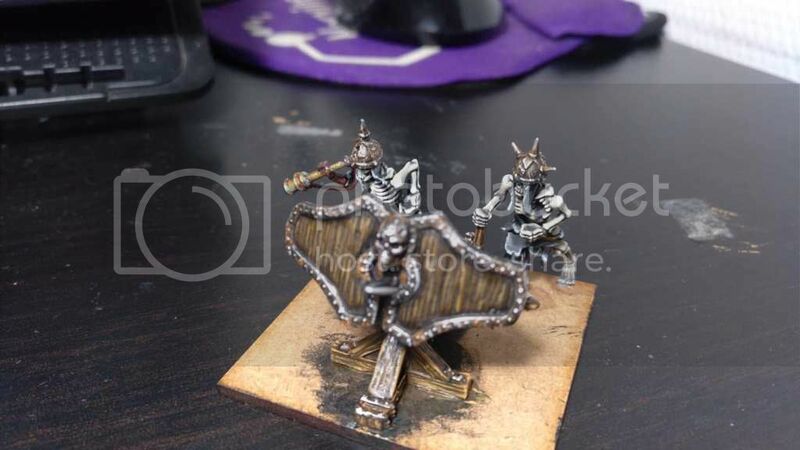 I personally do think the shields on the catapults are perhaps a bit too bland. They could have been a bit more exiting to differentiate between them a bit or add some personality to them. Of course, saying this I should add that SA comment applies to me as well. Mine would have taken twice as long and been half as good. I guess you are thinking of a freehand on them, and i tried! 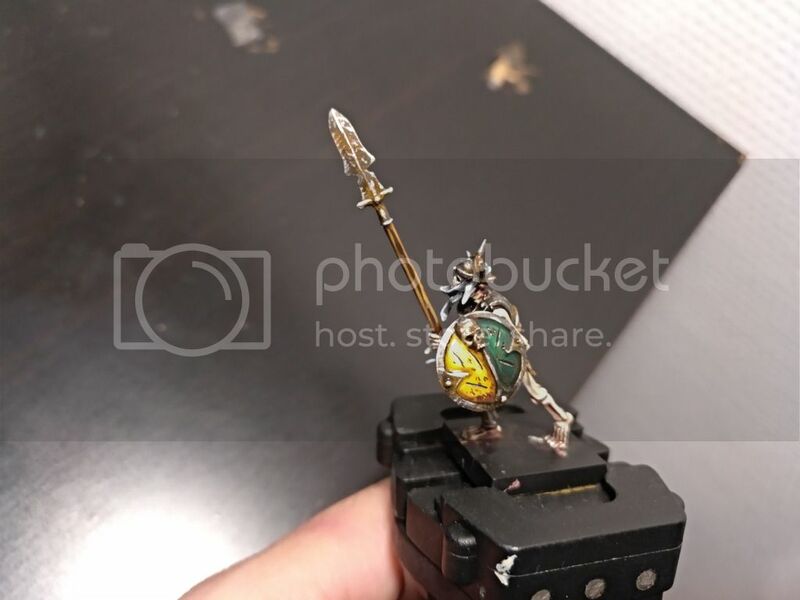 but really, i couldnt come up with any idea to draw on those shields so instead i thought id just use the army colours (the ones i intend to be the real army colours, dark green and black) but blending the lights on them and adding some scratches and dirt so at least they'd look technically cool.